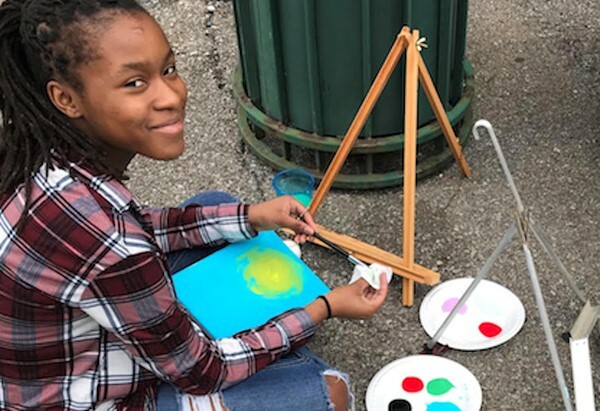 Eighth-grader Mahogany Johnson prepares to work on a painting at her station on the sidewalk during Downtown Mansfield’s Shop Hop. Nine Mansfield Middle School art students did an “awesome job” Friday evening as they created live art to the delight of downtown Shop Hop visitors. The student artists included Christopher Wicker, Breeasia Cains, Adrianna Bautz, Kara Mason, Lily Kime, Mahogany Johnson, Timbrie Justice, Angelina Harper and Gia Trombetta. The kids ended their evening with pizza in the studio of Element of Art on North Main Street.